Ask fellow campers about "Gaslight Square Mobile Home Park" and nearby attractions. Super concrete pads, nice asphalt roads, site was level, utilities reliable and convenient. Staff was very pleasant and accommodating. The place is an unexpected gem. 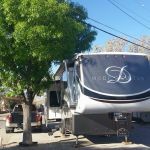 We camped at Gaslight Square Mobile Home Park in a Motorhome. About a block from outlet stores, a couple of miles from Camping World. Many restaurants, WalMart, Sam's, others close by. Nice small park.. Lots of trees... No manager on site.. She is down the street in the Mobile Home Park very nice .. Level sites with a small concert pad.. Laundry is small but clean.. Showers are large. 1 for women & 1 for men.. But your whole family can fit in one they are that big... No dog run.. just a small area for your dog to do its business.. Would be nice if everyone cleaned up after their pet!!! Wifi was good.. Cable was good.. Outlet mall right down the street.. Easy access to i10.. We camped at Gaslight Square Mobile Home Park in a Motorhome. Concrete site very level. WiFi signal strong. Verizon signal strong. Narrow sites which are closely spaced. A few have shade trees which are hard to come by in the El Paso area. About 1/2 mile from I-10, with easy access but no interstate road noise. Friendly office staff. I will stay there again. We camped at Gaslight Square Mobile Home Park in a Motorhome. We moved in here three months ago, and we love it. It's small and everyone is friendly. Lots of monthly tenants, but everything is nice and neat. Friendly people staying here, and a lot of us are working here in the area temporarily. Also a lot of overnights and weekly RVers. The management is great. I will miss them when we leave. I have also made lots of friends here. They have a nice pool in the mobile home section, but the RV tenants are welcomed. Nice wide paved roads, level cement pads and cement patios. The other areas are gravel, so not much dust blowing around. Nice shade trees and your lots are big. They aren't strict about how many vehicles you have, as long as it's on your own lot. We have our 37' fifth wheel with 4 slideouts, dually truck, motorcycle trailer and two motorcycles and still have a nice shady patio area. TV reception is good with lots of channels. Good Wi-Fi and we get good reception on our Verizon phones. I put $10 a night because that is what we pay for monthly rates, I don't know what nightly rates are. I would stay here again and again if in the area. We will be leaving soon, and I will miss all the nice people we have met. We camped at Gaslight Square Mobile Home Park in a Fifth Wheel. Stayed here for 4 nights and had a very enjoyable stay. Had concrete level sites, great cable TV and a very helpful and friendly host. We didn't use the restrooms or laundry but the area was well kept. We will surely try to stay here anytime we visit the El Paso area, if the park isn't full. We camped at Gaslight Square Mobile Home Park in a Fifth Wheel. Enjoyed the Hoppy Monk in El Paso. Great food and outstanding selection of beer! Service was top notch, too. Great location to visit the Sunland Racetrack and Casino. There is about 8 sites at the casino with e/w S15.00. Although technically in Canutillo, this park is most convenient for those visiting El Paso. Are you affiliated with Gaslight Square Mobile Home Park ?